Well, it's the 5th day of 2009 and I haven't started painting yet! I have been getting things cleaned up after the holidays, working on the paperwork for my business here in Florida, and started to volunteer at a local pregnancy resource center. Anyway, I have a painting that I started before the holidays which I have taken some progress photos of and I plan to get that done soon. We do have some family coming in this week from Michigan, so I might not get the piece finished, but I can certainly get the beginning pictures and descriptions onto the blog for you. The painting at left is one I did a few years ago. The Broughton Garden is a historical garden in Franklin, Michigan. 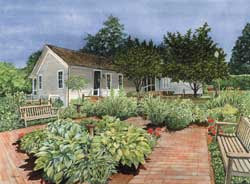 I know a few of the Franklin Garden Club members, and I have painted at their garden tours for the past four years. This particular garden is one in the center of town which the garden club maintains. I really enjoyed painting the hostas. You can see this piece in larger format on my website under Garden Portraits. Click here for the link. Stay tuned for the installment of the Hens and Chicks painting, which will be posted soon! I sincerely hope you have a blessed, prosperous and healthy new year.